It took ten years to complete this historical fiction based on personal experiences. Book cover credit: LaDue/Voss. 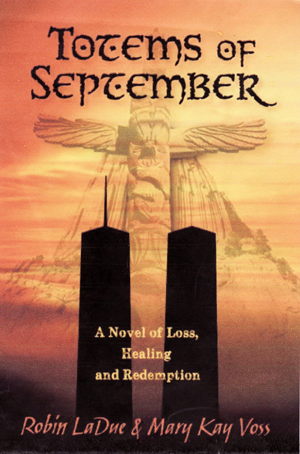 Mill Creek resident Mary Kay Voss and Cowlitz tribe member Dr. Robin LaDue released their co-written book “Totems of September” on September 29, 2013, a historical fiction of personal stories that "examine the events of September 11, 2001 and the aftermath from a non-political viewpoint." Dr. Ladue is of Taidnapam descent and an enrolled member of the Cowlitz tribe. She started this book in 2002 after a trip to Devil’s Tower, a famous geological feature in the Black Hills of northwestern Wyoming. “The beauty and wonder of a place that has so much native culture and beauty is surpassed only by the solidity and permanence of this tower, compared to the magnificent man-made towers of New York susceptible to human violence and terror,” said Voss. “Lola LeFleur and all the LeFleur women before her and to follow, fight desperately to change their perceived destiny. The warmth and healing of the Ranch, and the stability of Devils Tower in a world of terror, are integral factors in the healing of so many shattered lives. “One reviewer describes it as her first choice in ‘feel good books’ ranking it with ‘The Help’ and ‘Water for Elephants.'" The book is now available on eBooks (Kindle, Nook and Kobo), through Amazon.com, by request at University Bookstore, or call Mary Kay Voss @ 425-337-7084. 10% of all profits will go to the Catching the Dream fund, which gives college grants to Native Americans. You can read more about the book and the authors at their website, totemsofseptember.com.